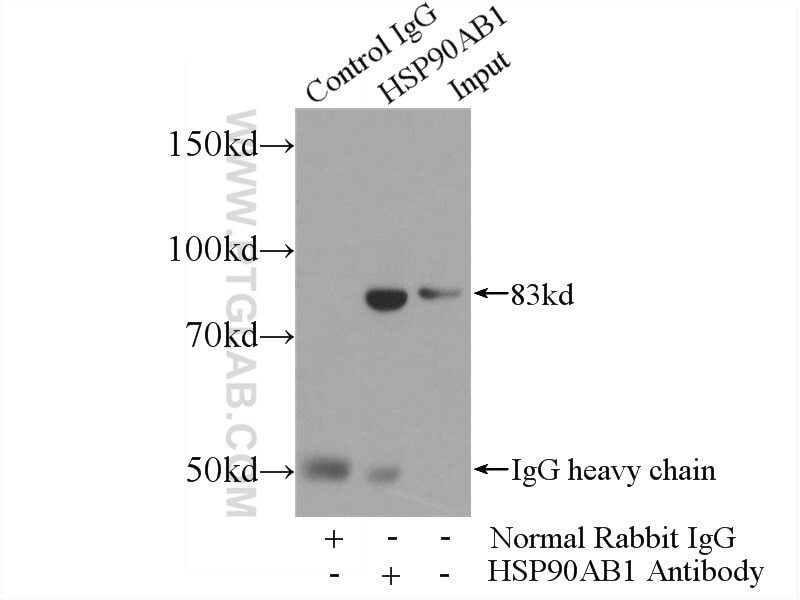 Immunofluorescent analysis of HepG2 cells, using HSP90AB1 antibody 11405-1-AP at 1:25 dilution and Rhodamine-labeled goat anti-rabbit IgG (red). Immunohistochemical analysis of paraffin-embedded human pancreas cancer tissue slide using 11405-1-AP (HSP90AB1 antibody) at dilution of 1:500 (under 10x lens) heat mediated antigen retrieved with Tris-EDTA buffer(pH9). 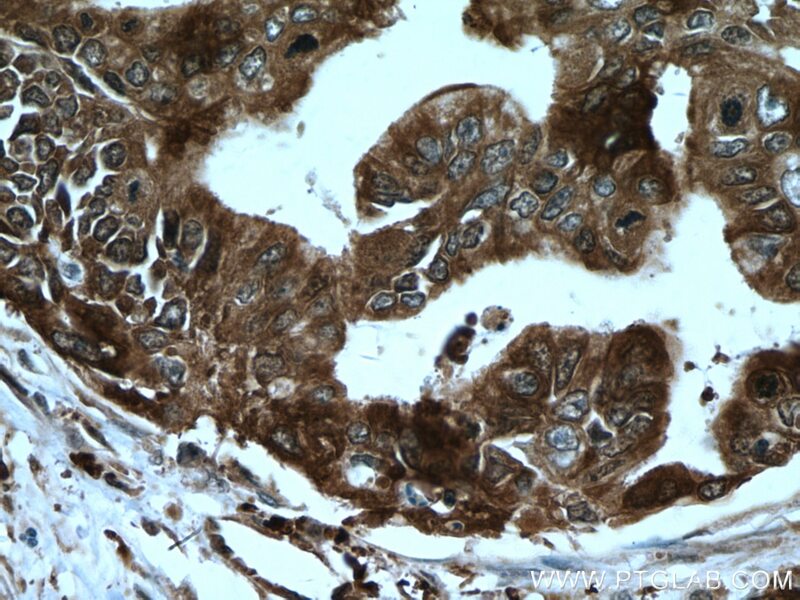 Immunohistochemical analysis of paraffin-embedded human pancreas cancer tissue slide using 11405-1-AP (HSP90AB1 antibody) at dilution of 1:500 (under 40x lens) heat mediated antigen retrieved with Tris-EDTA buffer(pH9). 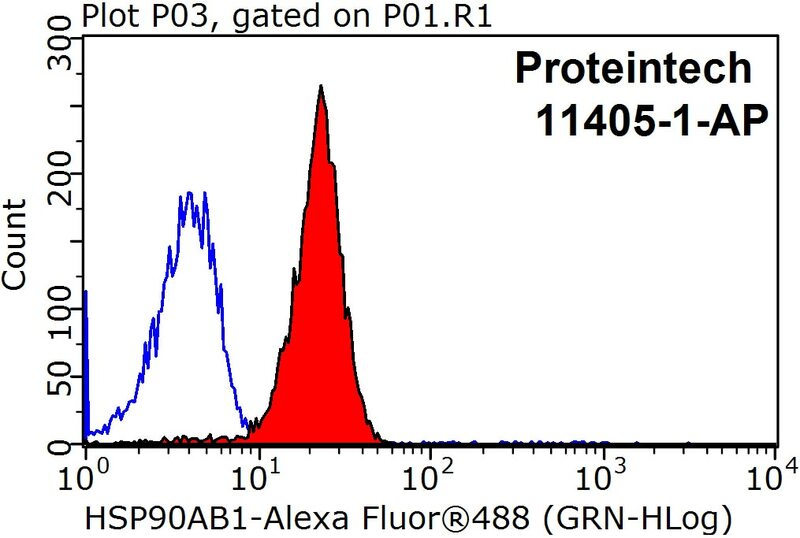 IP Result of anti-HSP90AB1 (IP:11405-1-AP, 4ug; Detection:11405-1-AP 1:700) with NIH/3T3 cells lysate 1200ug. 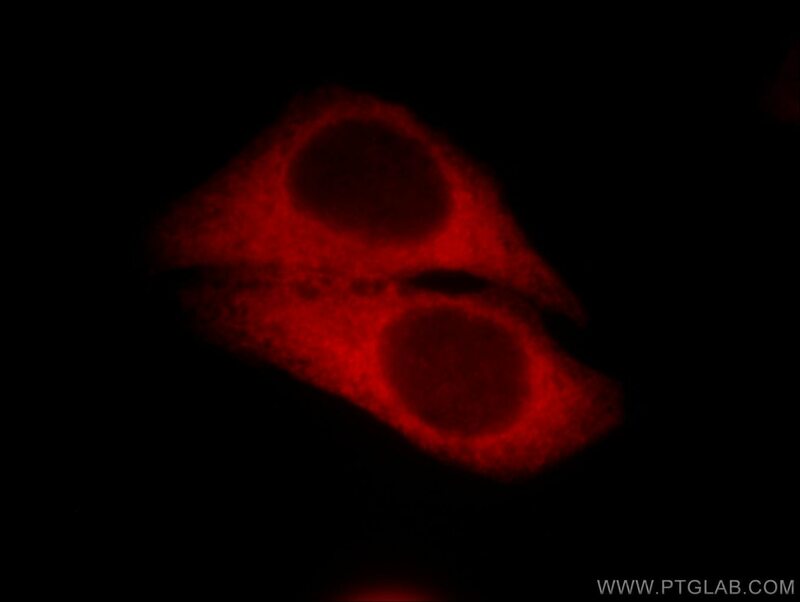 1X10^6 HeLa cells were stained with 0.2ug HSP90AB1 antibody (11405-1-AP, red) and control antibody (blue). Fixed with 90% MeOH blocked with 3% BSA (30 min). Alexa Fluor 488-conjugated AffiniPure Goat Anti-Rabbit IgG(H+L) with dilution 1:1500. 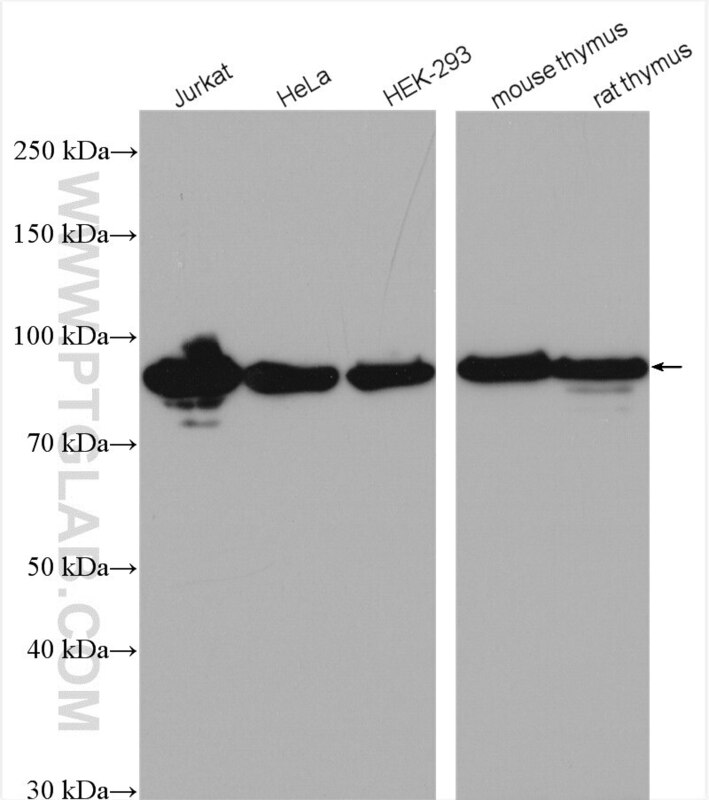 HSP90AB1, also known as HSP90 beta, is a member of HSP90 family which includes cytosolic HSP90 alpha (HSP90AA1) and HSP90 beta, endoplasmic reticulum related GRP74, mitochondrial TRAP1. HSP90 proteins play a versatile role in cell regulation, forming complexes with a large number of cellular kinases, transcription factors, and other molecules. 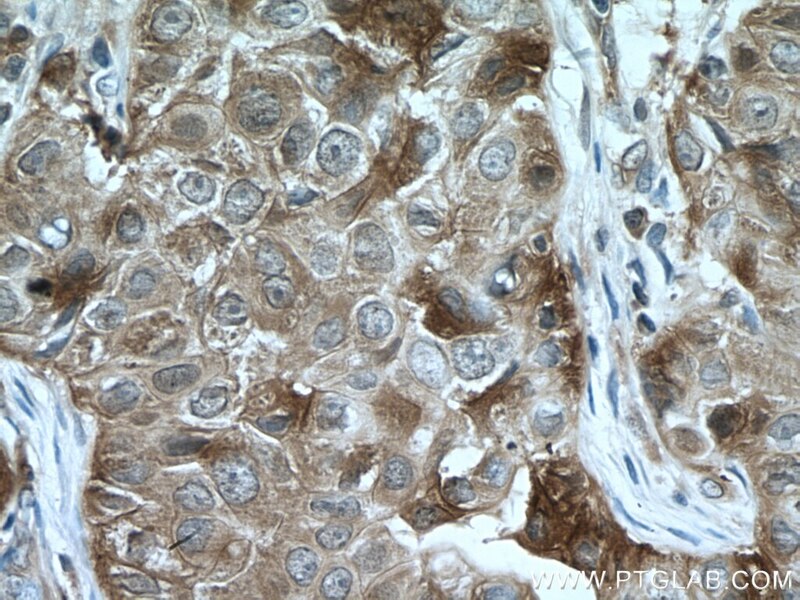 Upregulation of HSP90AB1 has been found in various cancers. 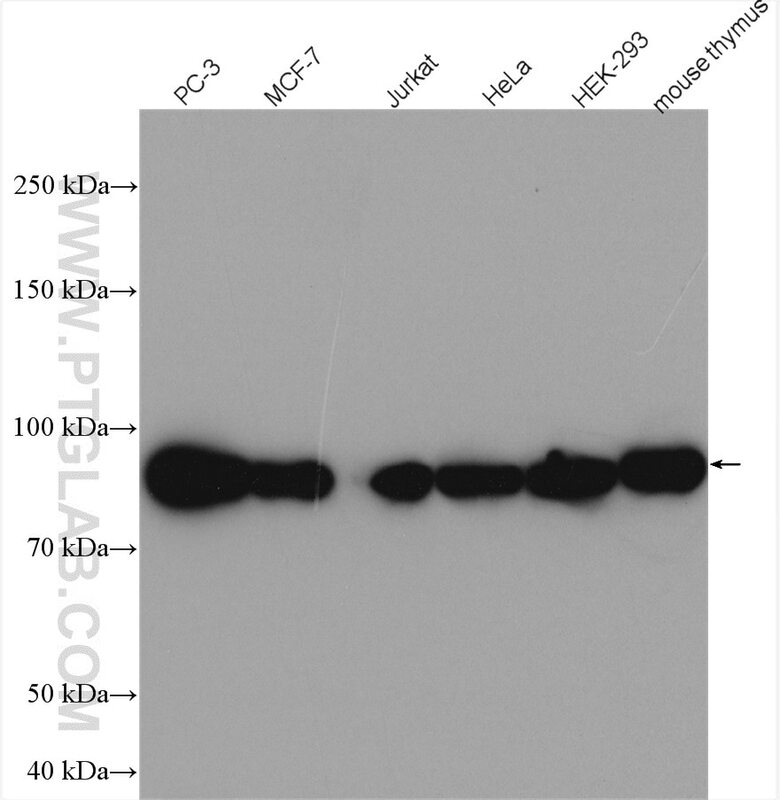 This antibody may cross-react with HSP90AA1 due to the high homology between them. Celastrol, an inhibitor of heat shock protein 90β potently suppresses the expression of matrix metalloproteinases, inducible nitric oxide synthase and cyclooxygenase-2 in primary human osteoarthritic chondrocytes. Quantitative proteomics reveals molecular mechanism of gamabufotalin and its potential inhibition on Hsp90 in lung cancer. Phosphoproteome Characterization of Human Colorectal Cancer SW620 Cell-Derived Exosomes and New Phosphosite Discovery for C-HPP. Quantitative proteomic analysis of deer antler stem cells as a model of mammalian organ regeneration. 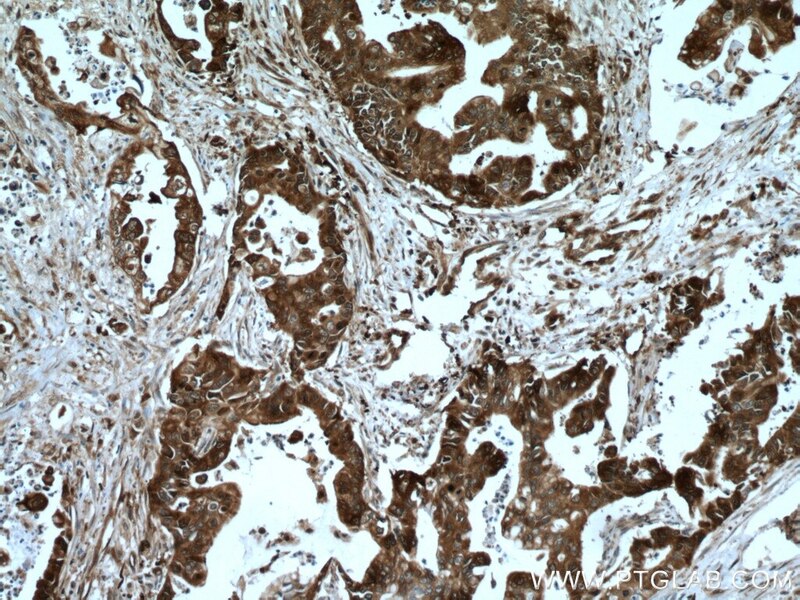 Immunohistochemical analysis of paraffin-embedded human breast cancer tissue slide using 11405-1-AP (HSP90AB1 antibody) at dilution of 1:500 (under 10x lens) heat mediated antigen retrieved with Sodium Citrate buffer (pH6). 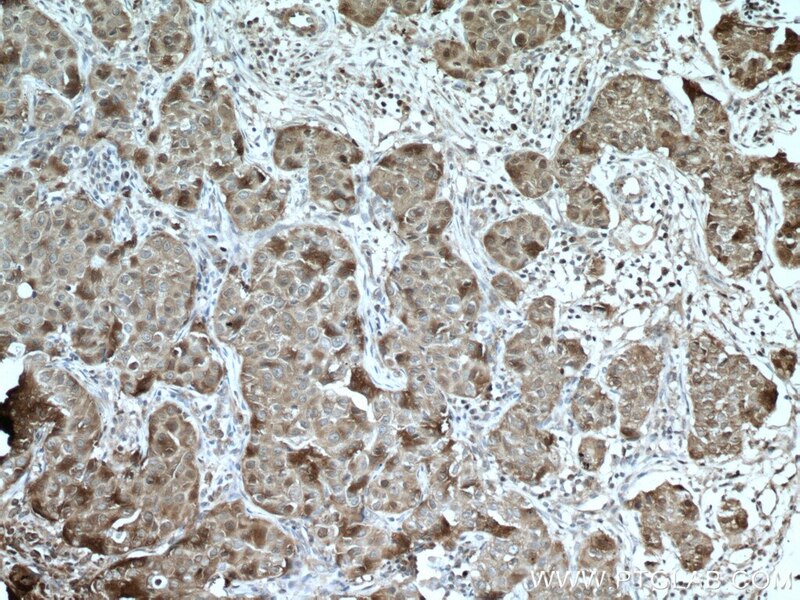 Immunohistochemical analysis of paraffin-embedded human breast cancer tissue slide using 11405-1-AP (HSP90AB1 antibody) at dilution of 1:500 (under 40x lens) heat mediated antigen retrieved with Sodium Citrate buffer (pH6).